Guess what? There are (only) 22 days left until Christmas. And I have approximately zero gift shopping done. Gulp! This year I made the promise to shop small and avoid big box stores. But in addition to supporting independent and local artists, I want to try my hand at giving homemade gifts. Double gulp! The thought of homemade gifts can conjure images of overly crafty Pinterest-fails and/or glittered covered macaroni necklaces. But we're here to reassure you that handmade gifts can be every bit as lovely as store bought. And they don't have to eat up a ton of your time. 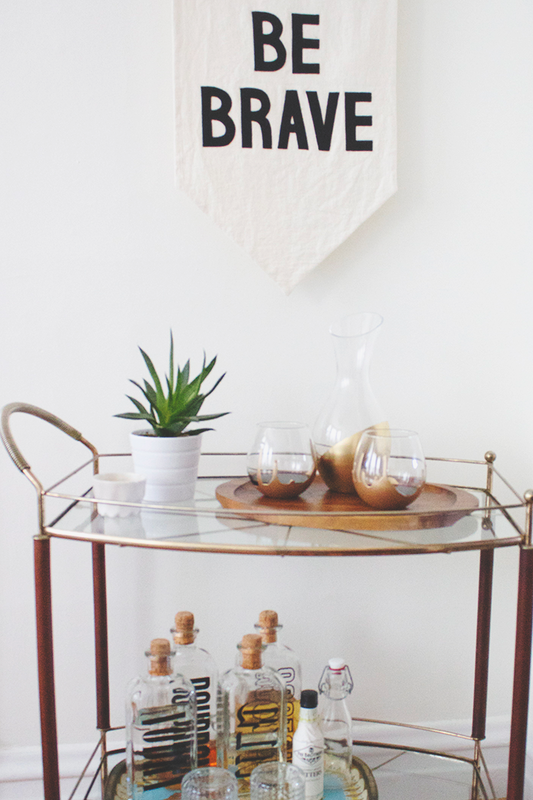 Proof: this DIY Dipped Decanter and Glasses set. This will make the perfect gift for the wine snob on my list (you know who you are)! 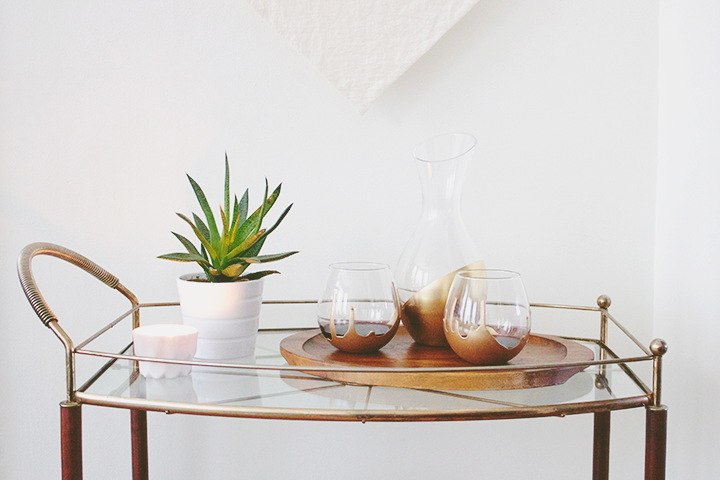 The look is luxe and modern without being too fussy or fancy. And the step-by-step is beyond easy. 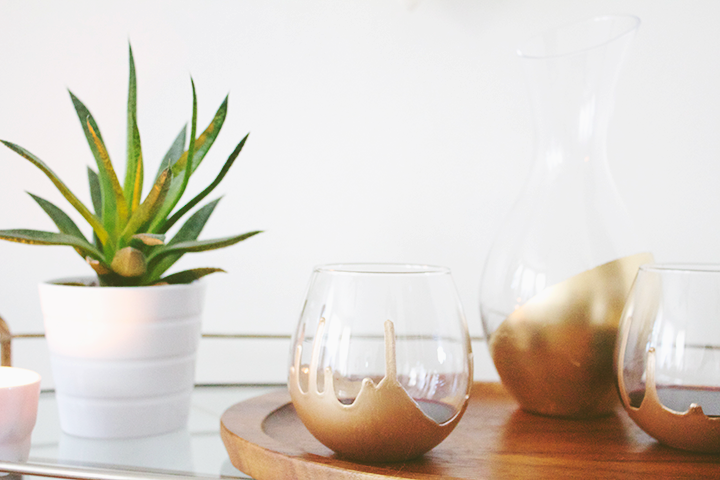 Dip Method // Pour paint in to a container just wider than the glass and dip. Lift glass and let excess paint drip off for 30 seconds. Turn glass mouth down over wax paper and let the paint drip and dry overnight. *Even though the paint is non-toxic, it's still not a great idea to put your mouth on it. Once the paint is completely dry, use an exacto knife to peel away any drips that reached the rim of the glass. Paint Method // Using painters tape, section off a portion of the glass to be "dipped". Cover the remaining exposed glass with wax paper (to avoid getting paint in this area). Paint the exposed glass below the painters tape. To create a smooth finish, use thin layers of paint, letting each layer dry completely before you add the next. Once enough layers have been applied, remove the tape and let dry overnight. To cure // Set glasses on rack in a cool oven and turn it 350 degrees. Bake for 30 minutes. Turn off oven and let it cool down completely before removing your glasses. Wait 72 hours before using. Hand-wash only to ensure you glasses last you a long time! Phew! Gift number one is checked off my list. 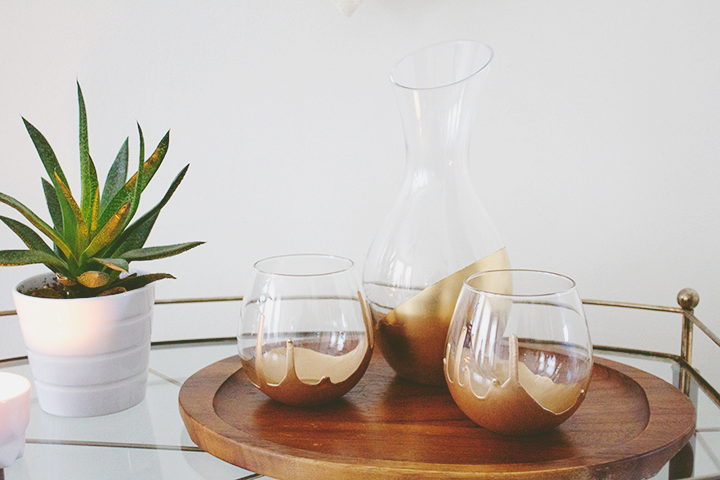 Plan on making a Dipped Decanter and Glasses set as a gift (or even for yourself)? We'd love to see! Make sure to tag #fmholidays.